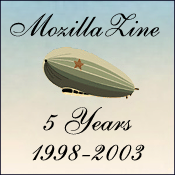 Though MozillaZine went live on September 1st 1998, the first article was dated August 30th. MozillaZine has run 1,660 articles since its launch. MozillaZine has over 6,000 members. The MozillaZine Forums have over 13,000 registered users. The infamous Phoenix needs a new name topic in the MozillaZine Forums received 1,909 replies, the highest ever. In the past, several people have posted in the forums claiming to be Linus Torvalds. We're fairly certain at least one of them was telling the truth. The MozillaZine backend was originally written for a guitar site called fingerstyle.com, which never really got off the ground. MozillaZine once had a Music to Code By section. Seriously. Back when it was just a Mozilla skinning tutorial and not a FUD fest, MozillaZine used to link to MozillaQuest. The MozillaZine AfterDark forum is named after a Mozilla advocacy weblog that MozillaZine admin Jason Kersey used to run. We receive spam via the Submit News form. We used to have adverts. Now we don't. Love us. Accidental deletions of important files are more common than you might think. We're still not certain whether it should be 'MozillaZine' or 'mozillaZine'.